As actors, it’s difficult for us to feel like our performance fate is ever in our own hands. But for artist and creator Andy Baldwin, waiting around was never an option. A recent transplant to NYC, Andy Baldwin has dedicated much of his life to building a professional theatre career in Dallas, Texas. Audiences and critics alike consistently praise his memorable performances in both comedic and dramatic roles (recently: Nathan Detroit, Guys and Dolls and Otto Kringelein, Grand Hotel; Lyric Stage). 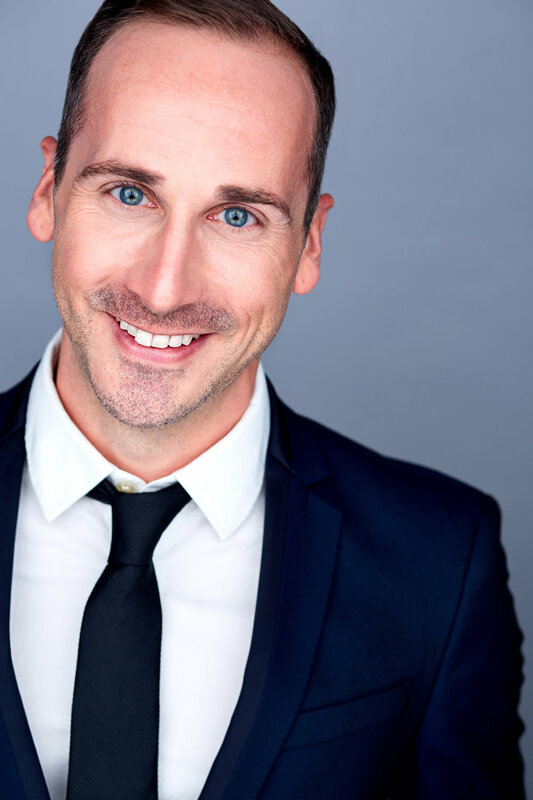 Andy studied Acting at Circle in The Square Theatre School in New York City and continued honing his theatrical skills as a resident actor at Casa Mañana in Fort Worth, Texas. But it’s his flair for creative direction and producing that caught my eye. His latest creation, SMILE with Artie Babel, is an hour-long radio show-style comedy presented in a series of 3 live “episodes.” The series will be playing in NYC at the Triad March 25 at 9:30pm, April 8 at 7:00pm and April 22 at 7:00pm. Read my interview below with Andy about his transition from Dallas to NYC as an actor, the challenges and triumphs of producing his own work, and his advice to other aspiring creatives. Tell me a little bit about who you are and your experience auditioning as an actor? My name is Andy Baldwin and I am 3 years into my move to NYC from Dallas, TX. I had been working as a professional actor in the Dallas/Fort Worth area since I was 18 years old. Most of my training came on the job as I spent 8 years as a Resident Artist at Casa Manana. I quickly fell in love with with Golden Age Musicals when I started working with Lyric Stage, a Dallas based company that produced musicals from that era with 30 piece orchestras! I learned to love being a character man while gaining a great appreciation for the composition of those scores, lyrics, and books. However, auditioning scares the hell out of me. I find I’m at my best when the environment suits me (and even that I have not been able to identify). What lead you to move from Dallas to NYC? The Dallas theatre scene is surprisingly large and small at the same time. It’s very easy to be seen as “one thing” or “one type”. While I was privileged to work almost non-stop for 15 years, towards the end I was doing a lot of the same work. I will gladly take a lot of the responsibility for that. If you want to be seen differently then you have to work towards that change. Of course, you are what you are and it’s a superpower to buy into the idea that you’re a badass and a commodity. At the end of the day I needed to challenge myself and wanted to grow. The dream, for me, was never Broadway or bust but simply never stop growing and evolving artistically. NYC offered me the change of pace and the opportunity to redefine that. What did you find different about auditioning in Dallas vs. NYC? At first, it’s incredible to be just a number in NYC… Invigorating! I was invincible. I was not worried about the familiar acquaintance behind the table judging me or gossiping about me later that night with other mutual acquaintances. I literally knew no one and that was freeing. When you audition over and over for the same people the game is different. There’s more pressure on growing your repertoire and trying new things but with great measure. Then… When you realize that NYC is a bigger version of Dallas… And you eventually start seeing the same faces behind the table 3, 4 ,10 times a year… Reality sets in. Auditioning is Auditioning is Auditioning. What led you to decide to create your own work? Warning: all answers to this question are selfish. First, I wanted more moments of feeling success. When creating your own work every single hurdle or task accomplished feels extraordinary. It’s the same validation you get with a callback or compliment or job offer. Second, I crave working with others. I have an incredible group of collaborators that have all bought into the concept. Being believed in is quintessential to success… No one does it alone. Third, EXPOSURE. If you’re not getting enough opportunities from others then, dammit, take it for yourself! Don’t let other people dictate or define your success. What inspired you to come to THIS specific idea? SMILE With Artie Babel is in the style of these old radio shows but the team is writing each episode or performance to deal with an issue of today ie. Immigration, Feminism, The Environment. The idea here is: Things never change, do they? Can we change? The best ideas worth exploring are not only the ones that challenge the audience but the ones that challenge the artists creating them. What has been the hardest part about creating your own work? Not being overprotective of the idea. Collaboration can be difficult if any part of your piece becomes sacred. Good ideas come from everywhere. It’s a new muscle for me to stay open and listen. I never want to be the smartest person in the room. What advice do you have for other actors that want to branch out on their own, but don't feel they can? PLAN IT, DO IT, ASK FOR HELP! I keep saying this to myself over and over. Plan it: Have an idea? Great! Now, start with a calendar and find a feasible, realistic date you can make this happen. Work backwards in the planning process. Think of all the ways it can go right then start punching holes in that narrative. Do you need more time? Fine… It’s not official yet so move the end date back! Do it: I mean, what else can I say here? What do you need to make it happen? Stop at nothing to get what you want. Wake up everyday thinking about it and go to bed knowing you did everything you could to work towards accomplishing it. It’s never about not having enough time. How much do you want it? Create time. Ask for help: This one is a doozy… Need help? ASK! And don’t be afraid to ask. I’m overwhelmed with gratitude at the amount of people who have worked on SMILE. From artists/acquaintances who came over to do collaborative readings of rough drafts to marketing/PR help to photography to Benefactors/Investors. People want to help! It’s true. Theatre is an incredible thing where people can participate in multitudes of ways and feel ownership for their part. If someone is interested in seeing your show- what’s the best way to get tickets? We have shows on Monday, March 25th @ 9:30pm, Monday, April 8th @ 7pm, Monday, April 22nd @ 7pm. Tickets can be found here. About SMILE: “A Delightful History We’re Doomed to Repeat” Written by the brilliant mind behind The Unbrunch, SMILE with Artie Babel is an hour-long radio show-style comedy presented in a series of three live “episodes.” A throwback to World War II-era radio shows, Artie Babel employs an uplifting union of popular music from the era, political satire and thrilling guest-stars to create a show that subtly points to the undeniable similarities in the hot-button issues of the past and the present. All three “episodes” will star Andy Baldwin, Brian Gonzales and Melissa McMillan. Episode 1: Monday, March 25 at 9:30pm Episode 2: Monday, April 8 at 7:00pm Episode 3: Monday, April 22 at 7:00pm The Triad (158 W. 72nd St., 2nd Floor). Doors will open half an hour before show time. Tickets can be found here.